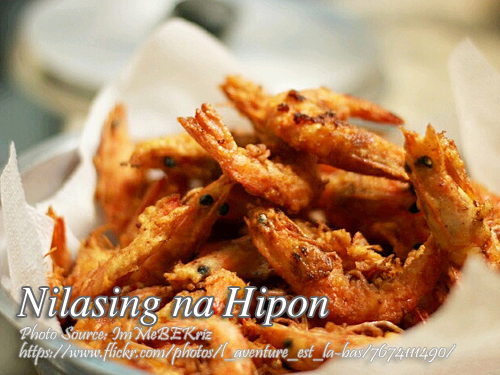 Nilasing na hipon or drunken shrimps is actually battered fried shrimps and marinated with Worcestershire Sauce, red chili, salt with a mixture of alcoholic beverage like gin or beer. The shrimps are not peeled and fried whole so you have to make sure the shells are crispy enough before removing it from the frying pan. To cook nilasing na hipon; Remove whiskers of shrimps. Marinate shrimps in salt, pepper, garlic, Lea & Perrins Worcestershire Sauce, gin or beer and chili for about 30 minutes. Drain. Combine flour and cornstarch and toss in marinated shrimps. Deep fry in hot oil until golden brown. Marinate shrimps in salt, pepper, garlic, Lea & Perrins Worcestershire Sauce, gin or beer and chili for about 30 minutes. Drain. Combine flour and cornstarch and toss in marinated shrimps. Deep fry in hot oil until golden brown. Serve hot. Serves 6. Tried this last for our boodle fight night with fresh Lato(seaweeds salad) and Crispy Adobo flakes! It was a sure hit!! My kids and my mom had more than 2 cups of rice!! Thanks! Hi Jingay, thanks for sharing your experience! Cheers!